Last week I participated in a four-day plein air painting workshop on Orr's Island in Maine. It was a wonderful experience from the gentle encouragement of our instructor, Marjorie Glick (check out her amazing watercolor paintings at marjorieglick.com), to the perfect weather, to the inspiring landscapes and breathtaking seascapes, to the talented and supportive company, to the graciousness of our hosts, and to the deliciousness of the macrobiotic meals (expect for the succulent soft-shell lobsters we had one night!). 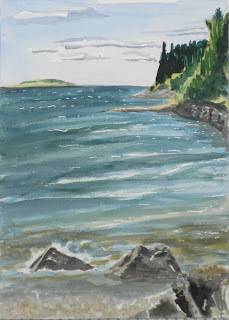 I enjoy plein air painting (painting outdoors) and it was a treat to have four whole days to do what I love to do. It was food for the soul. Every blade of grass his its angel that bends over it and whispers, "Grow, grow." I realized that I was the blade of grass and the whole experience of being in that awe-inspiring place with other artistic souls creating beautiful paintings was whispering to my soul and helping me to grow. I must admit that I had some concerns regarding my health and being able to fully participate in the workshop. First of all, four days of intensive creative work out in the elements could really flare up my fibromyalgia. I emailed the instructor ahead of time and explained my situation. Marjorie was very understanding and assured me that I could take things at my own pace. During the workshop, she periodically checked in on me and made sure I was getting enough rest. Second of all, I was worried that I would be too tired to drive home after four days of painting. Originally I was going to stay an extra night to rest up before the three hour drive, but my daughter unexpectedly came home from camp with mono, and I needed to get home as soon as the workshop ended. Luckily, I had another workshop student with me in the car who helped me navigate and kept me awake with lively conversation. Most importantly, I was worried about my lack of creative drive. Since dealing with the extraordinary health issues of the last two years - which I've chronicled in this blog - my creative drive has been in deep hibernation. Characters who had once urged me to write down their stories had gone silent. The desire to draw new illustrations was non-existent. While my physical body had mostly recovered, my emotional body and spiritual body were still wounded and in need of healing. When I thought about the workshop, I was worried that I would be a feast with no appetite! I'm happy to report that I ate my fill at the feast - literally and figuratively - and felt nourished by the renewed connection with my creative side. Now that I'm back home, I don't know if the creative juices will continue to flow. In any case, I'm reassured that they are not completely dried up and that the creative well will be there to draw from when I'm ready. In April I attended the Massachusetts CFIDS/ME & FM Association (MassCFIDS) Spring 2012 educational forum, co-sponsored by the Massachusetts Department of Health, featuring Dr. Benjamin Natelson, Director of the Pain and Fatigue Center at Beth Israel Medical Center in New York City, as the keynote speaker. In a surprise double-header, Dr. Natelson's wife, Dr. Gudrun Lange, Ph.D., a Neuropsychologist and a professor at the University of Medicine and Dentistry in New Jersey, spoke about how neuropsychological testing is used in CFS and FM patients. Dr. Natelson's lecture was titled "CFS Diagnosis: Are You a Lumper or a Splitter" and asked the question whether it is more beneficial to lump all conditions in which severe fatigue is a significant symptom - from CFS to FM to MS - into one group or to split patients into subgroups. Dr. Natleson was clearly in the "splitter's" camp. His 20 plus years of research proved that Chronic Fatigue Syndrome, Fibromyalgia and post-Lyme disease are separate medical conditions and should be treated as such. Dr. Natelson went a step further and divided CFS patients into subgroups as well, such as CFS patients with and without psychological disorders (usually depression). Dr. Natelson's approach of splitting patients into subgroups, depending on symptoms and related conditions, aligns with his theory that there are most likely several causes for CFS, and the subgroups help to narrow the pool of patients in order to determine specific causes. HERE'S THE GOOD NEWS: By using advanced techniques in medical science, Dr. Natelson is close to finding biomarkers to diagnose CFS! His research indicates the likelihood of a brain disorder as the cause for a specific subset of CFS patients. Dr. Natelson was recently awarded a federally funded grant from NIH to continue with his findings and he is looking for patients – both with CFS and healthy controls – to participate in his study. For more information, go to www.painandfatigue.com or call (212) 844-6747. Dr. Lange discussed the process for neuropsychological testing for CFS patients. Without the identification of the type of biomarkers that Dr. Natelson is currently researching, neuropsychological testing is presently the accepted standard to qualify for Social Security disability for CFS patients. Dr. Lange stressed that not all neuropsychologists are trained to test for the types of deficits common in CFS and that patients should seek out professionals who have experience in testing for CFS.